All are welcome to join the NIU College of Education for a fall tradition: The Community Learning Series. This semester, a “Superintendents Summit” panel discussion is planned at 6 p.m. Thursday, Oct. 24, in the Barsema Alumni and Visitors Center. 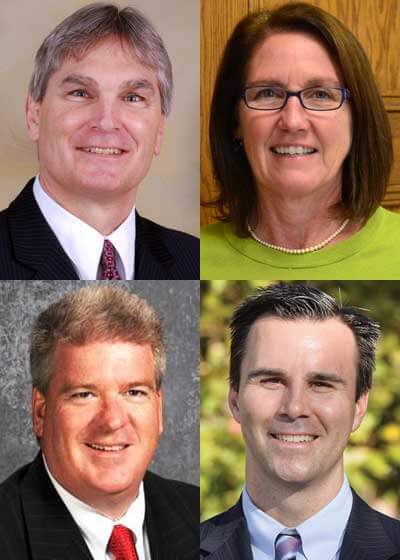 A reception with heavy hors d’oeuvres begins at 5 p.m.
Members of the panel are NIU alumni and friends who are currently the superintendents in DeKalb, Rockford, Sycamore and Wheaton. Free and open to the public, the summit offers a unique opportunity for teachers, prospective teachers, administrators, as well as parents and others in the community, to learn and ask questions about what’s happening in northern Illinois classrooms, career trends, new standards and other topics of interest. Briscoe arrived in DeKalb in 2008, when he began his tenure as superintendent. Under his leadership, the district opened an $80 million high school in 2011, and continues working with NIU to expand partnership schools. He received his undergraduate degree from the University of Wisconsin Whitewater, and his master’s and doctorate degrees from NIU. He began his teaching career in 1982 at Johnsburg Unit School District 112. Superintendent since 2012, Countryman understands the importance the community of Sycamore places on education and strives to create partnerships that enhance the lives of all stakeholders. She received her undergraduate and master’s degrees in education from the University of Iowa. She also holds a superintendent endorsement from Western Illinois University. Her tenure in Sycamore began in 2000 as the principal of Southeast Elementary School. Harris manages a $155 million budget and more than 1,700 employees. The district is currently implementing a five-year technology initiative and capital development plan to prepare all classrooms for 21st century learning. He received his undergraduate degree in secondary education from the University of Illinois at Urbana-Champaign, and earned his master’s and doctorate degrees from NIU. His career began in 1987 as a social studies teacher. Jarrett, who joined the district’s leadership team in June 2011 as an assistant superintendent, assumed his current role July 1, 2013. An active community member, he earned his doctorate in educational leadership from NIU. He previously was principal of Hononegah High School in Rockton for four years. During that time, Newsweek and the Washington Post recognized Hononegah as one of the top schools in the country. Patrick Roberts, chair of the college’s Department of Leadership, Educational Psychology and Foundations, will moderate the discussion. For more information, call (815) 753-8434 or email pbaker@niu.edu.